While Christina Evangeline spends much of her time caring for her beautiful young daughter, she also loves volunteering work in her community. The Cristian Rivera Foundation is a nonprofit working to find a cure for a horrible and deadly brain stem tumor known as Pontine Glioma. In 2009, a strong and loving little boy named Cristian Rivera passed away at age 2 after spending his whole life fighting this cancer. Christina Evangeline and others in the community offer great support to this organization so that one day no other families will ever endure the pain and suffering felt by Cristian’s loved ones. Save The Children Federation is a community organization that strives to put the health and happiness of children first. Through fundraising, volunteer work and other community events, Save The Children provides young individuals with the resources they need for a healthy start in life, allowing them to gain opportunities for a bright and successful future. Whether it is providing healthy food and books, sponsoring a child, or simply spreading the word, Christina Evangeline and other supporters are dedicated to making a real difference. Having a daughter herself, Christina realizes more than ever the importance of providing love and a happy lifestyle for a child. Every year in the United States, hundreds of thousands of children need to be rescued from abusive situations, neglect, or abandonment. These children face severe trauma as they are placed in foster care or homeless shelters with nothing but the clothes on their back and an uncertain future. 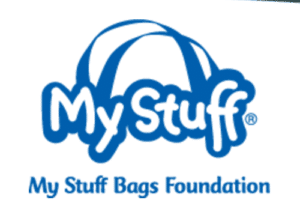 The My Stuff Bags Foundation hopes to make this transition easier for children providing them with new belongings that provide comfort and hope. Since its founding, My Stuff Bags Foundation has distributed over a half million bags nationwide filled with comfort items such as blankets and fuzzy stuffed animals.